EXCLUSIVELY geared towards people of above average size looking to start, restart or continue their weight loss & fitness journey. This class focuses on more than fitness, it also assists clients to achieve their overall goals towards a healthier lifestyle. When you are facing a more significant amount of weight loss, expert guidance, positive encouragement and specially designed workouts can go a long way in your journey. This class is taught by Nancy McBride, a trainer who has personal experience with her own weight loss journey. So as a kid I was always the “big boned” girl (thank you mom for being politically correct about the word fat) and as an adult I was the same. I did have a weight loss surgery 16 years ago when I was at my top weight of 405 (roughly the size of a barge)! But the surgery as much as it saved my life it didn’t teach me about my negative relationship with food , as I started gaining it right back! So at the end of 2015 I decided to do something about it! With the help of my amazing friends/family, my awesome trainer/friend Nancy McBride, my countless friends and support at Pt Fitness I feel like I am winning this battle. In less than a year I am down 56lbs and at least 22 inches as you can see in my before & after pics. — Keri B.
I absolutely LOVE this class, the instructor and participants. Each person is encouraged to participate at their own pace. I highly recommend this fun and energetic class to anyone who is wanting to get healthy again! — Elida F.
Seeing my personal results as well as having an awesome and encouraging trainer help keep motivated. Above Average Boot Camp at PTFitness has been a great experience! — Kristie R.
What is Above Average Boot Camp? 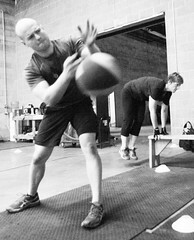 Above Average Boot Camp is a class exclusively geared to individuals of above average size looking to lose weight. It is a “Go at your own pace” workout that allows to you adapt the exercises to your specific fitness level. As you get fit, we make the workout a better fit for you. Can anyone attend Above Average Boot Camp? How do I qualify? There is not a specific weight you need to be to attend Above Average Boot Camp. However since the class is geared towards people looking to lose more weight than the average person, we typically suggest it for those who are looking to lose (roughly) 30 lbs. or more. The classes are at the PT Fitness Warehouse (1500 Northpark Drive#126 Fort Worth). The Warehouse is an indoor facility with restrooms. 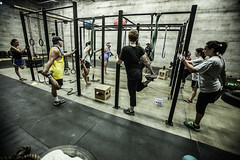 To make our clients feel more comfortable we strive to have the workouts in a more private area of the facility. When do you have Above Average Boot Camp classes? Who teaches the Above Average Boot Camp Class? The class is taught by Nancy McBride. Nancy is a Certified Personal Trainer who has experienced her own weight loss journey. After losing 150lbs over 10 years ago, she had found a real passion in working with individuals who are on their personal journey of weight loss. Her goal is to create a positive and motivating environment while giving you the tools to reach your goals. Classes are held in the warehouse, however be prepared to defend yourself against surprise elements like tires, humidity and elusive sasquats. Be sure to wear comfortable sneakers and bring an exercise mat, towel, and small hand weights (3-5lbs).